While I am not a big fan of the ballet, I am a huge fan of classical music and symphony orchestras. So, I am really looking forward to tonight's great adventure with the fetching Mrs. B when we will be attending Wortham Center in Houston to watch our Houston Ballet in a performance of "The Young Person's Guide to the Orchestra." The music, of course, is from the Englishman Benjamin Britten's wonderful piece by the same name. How they can make a ballet out of one of my favorite pieces of music will be very interesting to see. 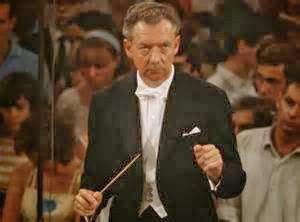 Benjamin Britten wrote the piece just as the title of the piece states, as an introduction for children on how a symphony orchestra works to make beautiful music. Britten uses a mesmerizing theme from a fellow Englishman, Baroque composer, Henry Purcell and uses that theme in a fugue and theme and variations style to demonstrate how the different sections of the orchestra sound. The piece begins with the Purcell theme by the whole orchestra, before it is broken down by each of the four sections [and the instruments in those four sections] of the orchestra: woodwinds, brass, strings, and percussion. The piece culminates with the entire orchestra coming back together in a stirring polyphonic majesty that includes Purcell's original theme. Benjamin Britten was a modern composer [living in the 20th century] who was not just a composer but also a pianist and conductor. I am sure he was proud to borrow his fellow Englishman's great theme for use in his "Young Person's Guide". The Young Person's Guide to the Orchestra is also referred to as "Variations and fugue on a theme by Purcell". As this is meant to be a guide for children, it is often accompanied by narration, with the narrator explaining the different sections of the orchestra. Sometimes, when this piece is played in a children's program, it is accompanied by another piece of music with narration for children by the Russian composer Serge Prokofiev, "Peter and the Wolf." Prokofiev uses the children's story to also explain about the sound of different instruments in a symphony orchestra. The narrator will explain which musical instrument represents which character in the story. That is why "Peter and the Wolf" and "Young Person's Guide to the Orchestra" may be the best two pieces used to introduce classical music to young children. From the Houston Ballet on You Tube I found this very short sample of what Sheralyn and I will be seeing tonight from our Houston Ballet and their orchestra. This looks like it will be good! Now, here is the complete grand music from Great Britain's, Benjamin Britten, "The Young Person's Guide To The Orchestra." While this does not have the narration that sometimes accompanies this wonderful music, it does have a description [at bottom] of each new section on the You Tube video. Please turn up the volume, play in full screen, and enjoy this haunting and beautiful Purcell theme put to orchestration by Benjamin Britten. Thanks for posting! I really wanted to go this performance! Thanks Francine....it was really amazing! As a former ballet dancer, I can't help but think that the dancing enhances the music and visa versa. Thank you for that little tidbit. The Houston Ballet looks (at first glance) like a solid company. Now you've piqued my interest! I'll browse on YouTube. Thanks Pamela. Like I said the only ballet I have been to before was The Nutcracker. This was so much different. It was so amazing in the first two acts the strength and athletic moves they showed. Wow, these weren't dancers these were great athletes out there! Then the third act that was actually when The Young Person's Guide To The Orchestra began was so beautiful, the music and dancing--and the narrator was really funny! :-))) I loved it.